The information presented here is the result of decades of pedigree research on the American sport horses, the Thoroughbred, the Irish Horse and the sport horses of Europe; work that required uncovering the fraudulent and erroneous lineages and correcting them, accessing historical records, taking the clues given us by the recent DNA studies. By the time I had got back to the roots of sport ability in the 1600s it became crystal clear that all modern sport arises from the Irish Hobby. It is possible to trace the root of the Irish Hobby back to the northern Iberian Peninsula where this peculiar population of horse seemed to first be recognized about 700 BC, identified as the Celtic Horse. It was a small horse, gaited and exceedingly fast. It was the fastest horse in the known world back then, by 400 BC the Greeks called them the Thieldones and immortalized them on the frieze of the Parthenon, and this breed was already the Roman's preferred steeds for racing. Pliny even writes about them in 77 AD, and we know when the Romans invaded Britain they brought those horses with them. But the Romans found that when they arrived they were met by the natives who had Celtic Horses already--horses which had been brought to Britain centuries earlier in trade from Spain by the Phoenicians for the tin mined there. This breed of horse is fairly easy to trace through time because it was gaited naturally and possessed notable speed and the other close by populations, such as in the southern Iberian Peninsula (Spanish Horse) and in northern Africa (Barb) were not gaited and we're not fast. This original Celtic stock was long established in Ireland, brought by the Celts themselves starting sometime around 600 or 700 BC from the northern Iberian Peninsula and continuing with each wave of immigration--and as in England also brought in by the Phoenicians in trade. By the dawn of the Christian era it is recorded that the Irish Horse was raced in chariots--already a sport breed. These horses and their ancestors have been documented as sport horses for two-thousand years. DNA studies have reinforced this history, for they have found the Irish Horse is 93% related to the remaining remnants of this Spanish gaited breed left in northern Spain: Cabbo de Gallo (McGahren "Genetic diversity of the Irish Draught population and the preservation of pedigree lines" 2006). It is fascinating also that when the Irish men were tested genetically it was discovered that 93% of them originated from northern Spain as well: Celts (Syles Saxons, Vikings and Celts 2006). The Irish Hobby lives on in its descendant breeds: the Irish Draught, the Connemara Pony, the Thoroughbred, and surprisingly in the sporting American breeds. The DNA origin studies found that the Thoroughbred, which had been long proclaimed to be of 'oriental' origin, is actually 68% related to the Irish Horse--it is its closest relative. Further, DNA studies have determined that the 'speed gene' came from the 'native English horse', which of course is the Celtic horse: the Hobby. But that is not all, because in the research on the large heart gene, it was traced back to the dam of Hautboy, a early Thoroughbred, by Marianna Haun and her team. Hautboy's dam was only identified as a 'royal mare'. Like the Thoroughbred itself, the royal mares that were its base foundation mares, were long believed to be some band of imported Arabian mares. These cherished beliefs however have been shattered by science, and it is now known most of the original mare families are those same 'native English mares' in other words, the Hobby and its direct descendant the English Running Horse. More recently the historical research of James R, Hardiman (www.bloodlines.net) has shed more light. He discovered that of the fifteen or so original mare families, that only the three of Sedbury Mare and her daughters were Barb and part-Barb, that all the rest were Hobby based mares. In addition, there are true foundation mares, like Wyvills Roan Mare, who was never assigned a family, but today we know she provided huge genetic contributions of speed--and she also is a Hobby mare. For example, the great early sire Blaze, the father of the trotter, is inbred to her 3x4 on his dam-lines. Others like Old Bald Peg, the Moroccan Mare, Masseys Barb Mare, Brights Roan Mare and many others are now believed to be mostly of Hobby blood. The English Running Horse was the pre-Thoroughbred racehorse breed of England; it is based on the Celtic Horse left by the Phoenicians and Romans, and improved with more speed from its cousin the Irish Hobby. The English Running Horse had been adulterated with other breeds arriving from the continent, so by 1500 it was not as fast as the Hobby. The Irish Hobby probably retained more of its speed faster because it was a more closed population, and so the original Celtic Horse was not watered down with other less athletic strains. In 1517 the Bishop of Armagh, when describing Ireland in a report sent to Henry VIII said: "the land itself produces absolutely nothing but oats and most excellent, victorious horse, more swift than the English horses." Evidently King Henry VIII listened to the Bishop because he bought Hobbies for his personal racing stable in 1528 and 1530. We know from historical sources that from about 1400 to 1500 there were wars in Ireland and many records were lost. But still in those reports that survived we find that the Hobbies were spoken highly for not only their comfortable saddle gaits, but for their speed, and that they were shipped far and wide. 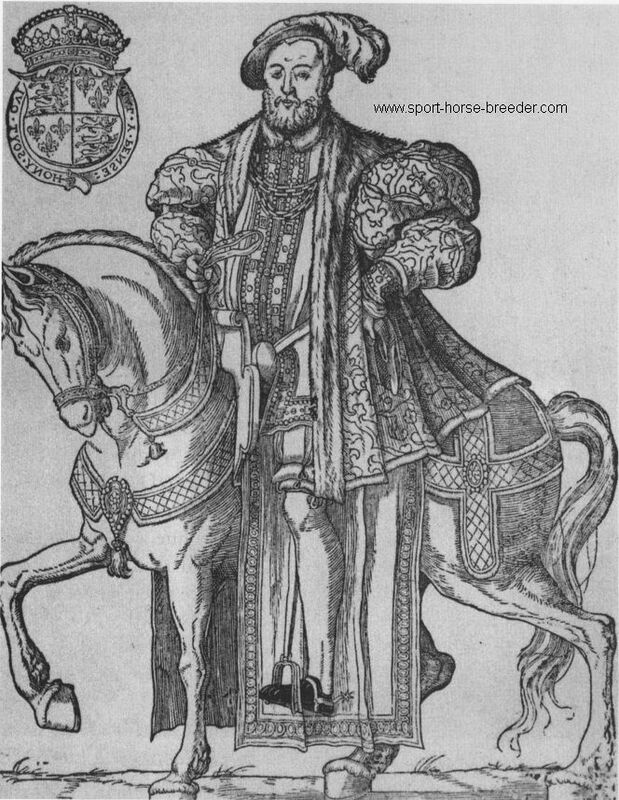 The chief breeders of the racing Hobby in that era were Gerald FitzGerald, the 9th Earl of Kildare in the early 1500s--he died in 1539, there was also Barnaby FitzPatrick, the 9th Earl of Osmund and Ossory, who died in 1581, and the Earl of Desmond from this same period. All three kept racing studs and raced their horses in both Ireland and England. The Irish Hobby is the genetic base of its direct descendants, and those breeds are the base of sport performance in the horse of today. In contrast, the horse of Europe was a draft horse--the performance opposite of a sport horse. What the Europeans bred in that same time frame was big, ungainly, slow draft horses--plow horses, not race or sport horses. In 1577 William Harrison published in Description of England : "Our horses moreover are high, and although not commonlie of such huge greatness as in other places of the maine [Europe], yet if you respect the easiness of their pase it is hard to say where their like be had." 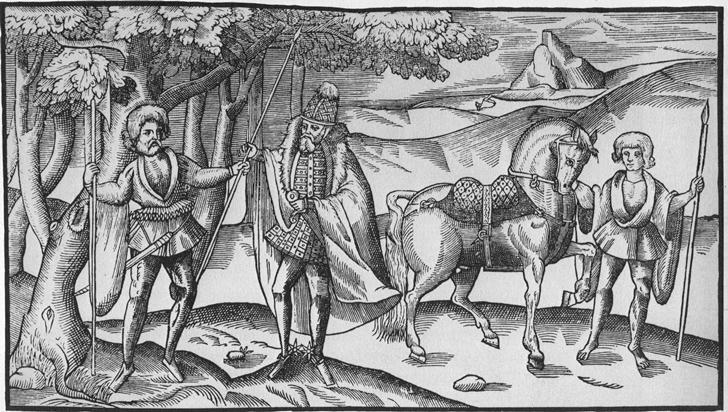 In 1565 Thomas Blunderville wrote: "The Irish Horse is a pretty fine horse, having a good head and a body indifferently well proportioned, saving that many of them be slender and pin-buttocked. They are tender mouthed, nimble, pleasant and apt to be taught, and for the most part they be amblers and thus they are very meet for the saddle and to travel by the way. Yea, and the Irishmen, both with darts and light spears, do use to skirmish with them in the field and many of them do prove to that use very well, by means they are so light and swift. In 1577 Richard Stanihurst describes the Hobby: "...of pace easier, in running wonderfully swift.."
So historically and by DNA studies, the chain of evidence for sport, first racing, but also hunting etc. begins with northern Iberian Peninsula and travels to Ireland and England with migrations and through trade, later with Roman invasion. The population on Ireland retains the greatest speed because it was less contaminated with lesser sport breeds. Later when racing became the province of the Kings and nobles of England, they went to their then dominated holdings in Ireland to retrieve the fastest racers. The Irish Hobby was valued higher than the English Hobby (English Running Horse--Scottish Galloway) because it was faster. And there is ample evidence of the bringing in to England of the Irish Hobby, such as multiple shipments to King James. Thus Celtic based Hobbies were the fastest racehorses in the known world, plus because of their comfortable mid-gaits and their wonderful gentle temperament they were also the preferred riding horse, and were regularly given as diplomatic gifts because of these unsurpassed traits. For example Queen Anne sent six Hobbies to King Louis XIII in France. From 1611 to 1660 Irish Hobbies and English Running Horse were exported to the American colonies, they became the base of the American Running Horse. Then came 1642 and everything changed, and Cromwell and his buddies destroyed the racing studs of the previous political powers, including the studs in Ireland. Later on (1648-1731) James D'Arcy and his wife Isabell Wyvill gathered back all the remnants they could find of the previous era, and established their stud based on the Hobbies and the English Running Horses---if they had not done this there would be no Thoroughbred racehorse today. In England, the Thoroughbred of course, but also the trotting breeds of Norfolk Trotter and Yorkshire Coach all got their speed--and their trotting action, from the early Thoroughbred stud stallions and mares, which were often largely Hobby or Running Horse. The Thoroughbred, because it was based on the gaited Hobby at one time had many horses that were able to move at speed at the pace and trot as well as the gallop. Blaze of course is renowned for his ability to impart trotting action on his descendants. 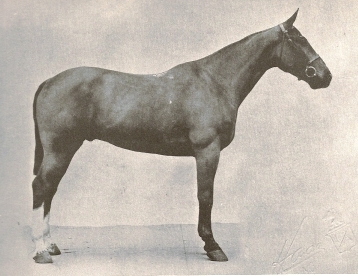 Lesser known is that some of the early Thoroughbreds were pacers or could produce them--including Janus and Bedford, who were valued for their ability to produce gaited saddle horses in America, and Sir William Don, a pacing Thoroughbred who was imported to Australia, and Miss Hervey, a Thoroughbred line that threw pacers. In the meantime in Europe, the breeding studs were producing the Black Marsh Horse, the Schwere Warmblood, the Holland Black and the French Draft breeds for agricultural work. Their studs were not producing racehorses or any other sport based breeds, and they did not have the speed to breed up from anyway. I know the warmblood societies claims hundreds of years of experience in sport horse production and also centuries for their esteemed inspection system. However, they never produced a true sport horse until the imports from the British Isles brought them speedy and athletic light horses. And the hundreds of years of inspection system must be a fairy tale as well, because as far as providing stock for the modern warmbloods I can find no evidence of this supposed superior European sport breed that we are told was carefully developed over hundreds of years. All I find is their farm stock and even then very little lineage is preserved. Whenever I trace their sport warmblood pedigrees back through time, by the early 1900s and the later 1800s, huge blank sections emerge and except for Thoroughbred lines and Anglo-Norman, Norfolk Trotter, Irish Hunter and Yorkshire Coach lines---nothing is recorded! And yes, some Spanish Horse and Arabian made inroads in their stock, for the purpose of 'lightening up' their heavy stock, but it did not provide athleticism. Evidence of 'sporty' horses arrived with the addition of the Anglo breeds. And I can find no evidence of the European sport horse in their sport horse lineages. Instead I discovered the bloodlines that are recorded go back to the Mecklenburg stud. And you see foundation stallions then like Kingdom 1878, Brilliant 1872, Jellachich 186?, Zerneberg 1845, Norfolk 1843, Falb 1892, Ethelbert 1879, Duke of Cleveland 1845 etc. In multples and the rest of the pedigree blank. What breed are those horses? They are either imported themselves or bred from imported Norfolk Trotters, Thoroughbreds, Yorkshire Coach and some even have Irish damlines like Jellachich and Zerneberg---they are not European developed breeds. It was the Anglo horses that were imported in vast amounts by the Mecklenburg stud to create a proper coach and carriage horse, because the European horse was a draft based horse, and it was too slow and ponderous to be useful in coach or carriage work. The East Prussian Horse in some literature is said to have been a sport horse in the 1800s--but it wasn't either, it waffled back and forth from agricultural to cavalry, and it imported huge numbers of English Thoroughbred and even some American Running Horse to lighten up their breed to be a better cavalry horse--their stated goal was to make it more like the Thoroughbred. The French of course developed their French Trotter in the mid-1800s, a true sport breed. What was it made of? Thoroughbred once again, Norfolk Trotter, Yorkshire Coach and Anglo-Norman, and even some American Trotter to improve its speed and trot action. For example, the horse called 'the Hambletonian of France' is Fuschia FT, and he is found everywhere in the racing trotter and its descendant the Selle Francais--he is 1/8 American Trotter. Found in the background of just about every French Trotter in multiples is a foundation mare, La Juggler 1838, she is by the English Thoroughbred Juggler out of a Yorkshire Coach dam. The Hobby bloodlines live on in the Irish Draught, the Connemara Pony, the English Thoroughbred and the American sport breeds. Attached is a pdf of the references used in the American Running Horse series and in this article. A recent addition to these references is: Albenda, Pauline "Horses of Different Breeds: Observations in Assyrian Art" 2004.